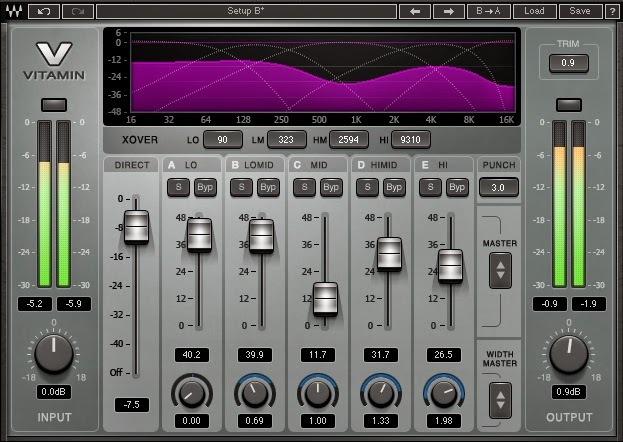 Waves Audio has released a new plugin called the Vitamin Sonic Enhancer. It's a multi band enhancer that gives you parallel eq, compression, saturation plus stereo width control all in one. It might not be the first to offer some of these features ( Izotope's Ozone and Pro Audio's Dynamic Spectrum Mapper comes to mind) but at $99 it's hard to resist. I haven't yet tried it but felt I should mention it on the blog. Would you add Vitamin to your list of go to plugins? "Waves Vitamin is a multiband harmonic enhancer and tone-shaping plugin that can make any track sound powerful and full of spark by mixing an enriched version with the original signal." "Whether used on vocals, guitars, synths, drums or an entire mix, Vitamin opens up the sound in a way that truly complements and enhances the original signal, ensuring your tracks get the nutrients they need."